Bhante Pemaratana will be back with us for another 6-week series, based on Buddhist Philosophy. This time we will learn about the philosophy behind meditation (Theory) and techniques of meditation practice (Practice). If you have been to Bhante’s classes, you already know what a gift the time spent with him is. If you have not, we hope you consider adding this little piece of calm and bliss to your Mondays! 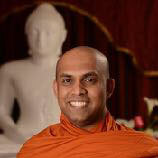 Bhante Pemaratana is the Chief Abbott of the Pittsburgh Buddhist Center in Natrona Heights,PA. Born in Sri Lanka he moved to the US in 2008. He holds a Master’s Degree in Philosophy from the National University of Singapore and a PhD in Religious Studies from the University of Pittsburgh. Currently, he teaches at the University of Pittsburgh as a part-time faculty member. He offers workshops on meditation at the Pittsburgh Buddhist Center, Yoga Studios and public libraries in the greater Pittsburgh area.